Since first teaching at Webster in 1994, his experience and "old-school" approach to journalism made a lasting impact on many students and their future careers. As an adjunct faculty member for more than 20 years, Bishop was known by many as "a cantankerous grader and a man of considerable wit and outspoken opinion," according to former faculty member Thomas Crone, whose tribute to Bishop in St. Louis Magazine quotes reflections from several former students and School of Communications colleague Don Corrigan. 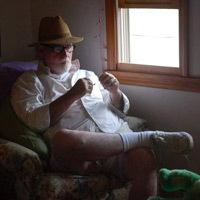 Bishop was also a former managing editor of The Riverfront Times and columnist and editor of the St. Louis Journalism Review, which was previously housed in the School of Communications. Details for services are pending. This post will be updated with further information.